Schools will be inspected more often from September 2021 to give assurances on standards as the new curriculum is rolled out. Under the proposals, Estyn inspectors would visit schools at least twice within a seven-year cycle. The new system would start after a one-year pause in inspections from September 2020 to August 2021 to allow schools to prepare for the curriculum. A teaching union said it was concerned about the plans. The proposals are in response to a review last year of the inspectorate Estyn by Prof Graham Donaldson who also designed the new curriculum. That review called for a one-year halt on inspections followed by a move towards more self-evaluation by schools. But the Welsh Government said there would be more inspections after the "partial suspension". It said local authorities, independent schools and schools that are a cause for concern would still be inspected during the one-year pause. In the shorter term, it is proposed that Estyn plays a greater role supporting schools to prepare for the new curriculum. 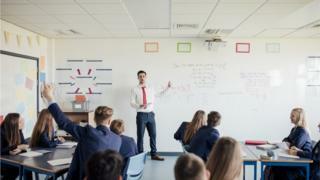 Schools will be able to see the new curriculum from next year and it will be introduced on a compulsory basis from 2022 in primary schools and the first year of secondary. It will then be gradually rolled out before reaching Year 11 in 2026. The Welsh Government said more inspections from 2021 would provide "more frequent assurances" to parents about "the standards being achieved and priorities for improvement". "The proposed changes are part of a broader culture change that we need to see in our schools - and culture change always takes time," Education Minister Kirsty Williams said. The National Education Union Cymru said it would be responding to the consultation on the proposals. "Our members would be concerned about changes which could include more inspections by Estyn in our schools," said its Wales Secretary David Evans. "Estyn inspections can cause an increase in stress and workload, and move the focus away from learning, which should be the most important thing for everyone in education." Plaid Cymru's education spokeswoman Sian Gwenllian AM said the move was not the answer to raising standards. "There are so many layers in the system - the schools themselves and their management teams, the governors, Estyn, the local authorities and the consortia and the Welsh Government education department. Who takes responsibility? "Accountability must be improved at once and the inspection and support arrangements need to be reviewed, in order to better co-ordinate support."